The University of Missouri-Kansas City celebrates the impact of a longtime friend, generous donor and educational visionary, Hugh J. Zimmer (1930-2019). Zimmer was the retired chairman of Zimmer Companies. His impact on Kansas City, and on UMKC, would be difficult to overestimate. At UMKC, he was known as a tireless and ardent supporter of the School of Education and its efforts to address the needs of underserved children in our urban neighborhoods. His generosity has been instrumental over the years in building the school’s capacity to deliver on that mission, and he devoted his time and talent as well, serving as the chair of the Chancellor’s National Advisory Board for the school’s Institute for Urban Education. The school’s highest honor is the Hugh J. Zimmer Award for Excellence in Urban Education. Hugh Zimmer talks to UMKC students at an event. 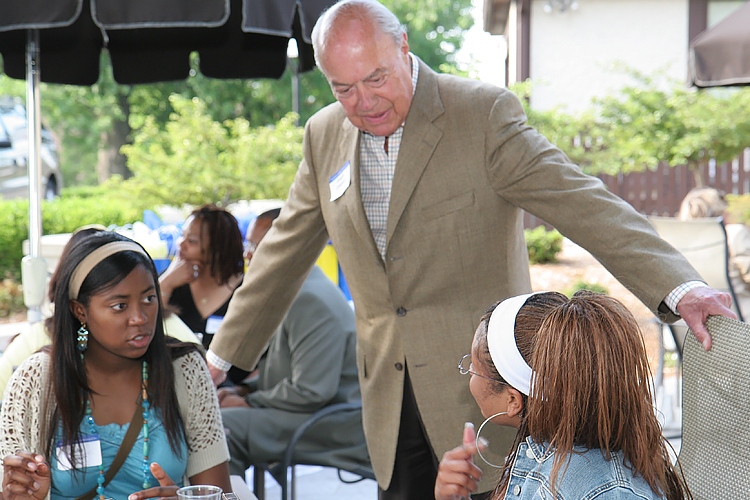 Zimmer helped develop several new opportunities for UMKC students. As a former chair of the UMKC Trustees, he was instrumental in the founding and development of the Trustees’ Scholars program, designed to retain the region’s best and brightest young people for education at UMKC, and then to build careers in Greater Kansas City. He also served many years as a member of the UMKC Foundation board. A highly successful real estate developer, he funded and led the creation of the Hugh Zimmer Equity Planning Internship Program in the UMKC Department of Architecture, Urban Planning + Design, in which students work with a local community-based organization. In 2010, he was awarded the UMKC Chancellor’s Medal – the highest non-academic award the university offers to a volunteer. In 2014, the UMKC Trustees recognized Zimmer as the first recipient to follow Henry W. Bloch in receiving the Henry W. Bloch Trustee Excellence Award for his significant contributions and service to UMKC and the UMKC Trustees. Leo E. Morton, UMKC chancellor emeritus and chief operating officer at DeBruce Companies, said Zimmer was instrumental in placing Morton on the UMKC Board of Trustees, which led to Morton’s selection as chancellor, a post he held for nine years. “People would joke that they would hesitate to pick up the phone if Hugh Zimmer was calling, because they knew that he would be asking you to volunteer for something,” Morton said. “But in fact, most people would pick it up on the first ring, because you knew he was trying to do great things for Kansas City and the people of Kansas City. As a civic leader, Zimmer chaired the Kansas City Area Development Council, the Economic Development Corporation of Kansas City, the Convention and Visitors Bureau of Kansas City and the Hawthorn Foundation of Missouri. He served on the boards of directors and executive committees of the Greater Kansas City Area Chamber of Commerce, the Platte County Economic Development Council and the Lenexa Economic Development Council. In 2010, the Kansas City chapter of the Urban Land Institute presented him its Lifetime Achievement Award in recognition of his ongoing contributions to the built environment in the Kansas City region. In 2004, the UMKC Henry W. Bloch School of Management named him Regional Entrepreneur of the Year. In an article observing his company’s 65th anniversary, Zimmer said his education-focused philanthropy was motivated by enlightened self-interest.